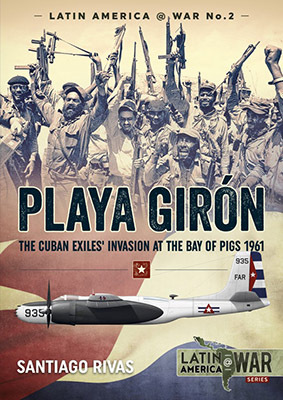 The second title in Helion's Latin America @ War series takes a look at one of the famous CIA-Cuban events of the Cold War, the Bay of Pigs Invasion in 1961. Volumes have been written on the whole Cuban revolution period, from Fulgencio Batista's ousting to Castro's consolidation of power and ultimate acceptance of Soviet support. The Bay of Pigs invasion came about two years after the initial revolution and was put on, with the CIA's backing, by Cuban exiles. It was a resounding defeat by the invading forces, where failures across the board in planning and execution resulted in the capture of most of the exiles. This book provides a detailed look at this event and the equipment utilized by both sides. An interesting side to the Bay of Pigs invasion was the use of airpower. The Cuban Revolutionary Air Force had little to throw up against the US-backed exile force, yet it managed to maintain air superiority, denying the exile force from effectively utilizing their B-26s. At the same time, the Revolutionary Air Force managed to sink the main transport ships and forced the remaining vessels to leave, a feat that was impressive and devastating to the invading exile forces. Without air support, they quickly succumbed to the Cuban forces, despite experiencing initial successes. With no hope of resupply, though, their surrender was inevitable, and the Bay of Pigs Invasion will go down as one of the great debacles of the CIA and US government. The author has done some extensive research, which includes not only poring over government documents but also interviewing some of the remaining participants of the operation. These personal anecdotes and historical documents are further enhanced by the multitude of photographs included in the book, many of which have not been seen before. Also presented in the book are maps detailing the area of operations. A bibliography provides a useful reading list should you want to delve deeper into the subject. This is a great continuation of the Latin America @ War series, and I look forward to seeing what the next subjects in this arena will be. There is no shortage of aviation history in Latin America, dating back to the early 20th Century, so it should be interesting to see what's next. My thanks to Casemate for the review copy.